Leadership is not just for those with a corner office or an MBA hanging on the wall. Leadership is not just for those with the title “Chief” or “Vice President.” The reality is that leadership happens in different contexts, including in the self-context, and at every level of an organization. One of the most often overlooked, underinvested in, and biggest gap in developing human capital in an organization is Self-Leadership--an individual who is intentional about influencing themselves and others toward a common objective. Self-leadership is about developing and managing your individual energy to initiate, motivate and perform at a high level, improving and sustaining your organization’s leadership philosophy at an individual level. It’s everything from how you wake up and conduct your morning routine to the strategies you use to keep your daily life flowing and organized. It’s the reflection of yourself other people see that inspires and empowers everyone to pursue excellence in every activity performed toward a common goal. To lead others, you must first look within. See how self-leadership influences the way organizational #leadership evolves and how you can use the benefits to your advantage! @InspireSoftwareTweet This! For a leadership development program to thrive in your organization, self-leadership must be a foundational development strategy. Investments in leadership can’t be only at one level of an organization, but accessible at every level, from the executive team, to middle managers, to frontline employees. If you don’t foster individuality and encourage your employees to express their thoughts and ideas about performance, through a common language, how can you expect them to foster an environment of true collaboration? 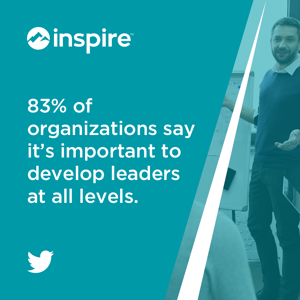 83% of organizations say it’s important to develop leaders at all levels. The development of all leadership begins at an individual level. When you align your leadership goals with your organization, you’re actually creating a system for organization-wide leadership. But in order for these goals to succeed, they must empower the people of the organization first. If the way you lead is a reflection of the goals you set, incorporating strong, well-grounded self-leadership tactics will give employees an example of the type of leadership it takes on the individual level to move the organization forward as a whole. These self-leadership tactics can be as simple as learning how to create effective goals that are aligned with their role and their team’s highest priorities to meet the client’s needs. It also includes their ability to manage their time well by tracking daily progress on the goals they set and following through with your daily to-do’s or maintaining an organized schedule for performance feedback. By empowering individual employees in the leadership process, by training them that successful leadership strategies cultivate autonomy and build their competencies while collaborating more effectively with their managers and team members. Don’t wait to lead. Business is moving too fast to wait around for direction and support to achieve an objective. Once a goal is set and approved upon between a manager and a direct report, it’s the responsibility of the individual to set out to achieve the goal. Individual’s without self-leadership training can naturally default to a victim mindset – waiting for someone else to give them the power to change things. Managers are not mind readers and can not be expected to intuitively know what the individual’s needs are without the individual “managing up” to help get those needs met. While 93% of managers feel they need training on how to coach their employees, it’s important to be speaking the same leadership language when coaching them. Only when individuals know what skills their manager is using during the collaboration process, will they be able to understand the process of working through the challenging phases in pursuit of their key objectives. When individuals understand the same leadership skills being used by their managers, they will be empowered to freely pursue their goals with a mutual understanding and trust with their team leader and other contributing team members. Do it the organization’s way. Do it in a way that helps you and the organization grow and improve over time. Sometimes your individual needs don’t align with the strategies of the organization. The key is to determine if you can optimize your motivation use your skills and knowledge to align the goals of your vision to what the organization can accommodate or improve. While your goals may look great on a dashboard, there’s a difference between being hopeful for what your organization can accomplish, and realistic about what it can actually do with the current scope of production or ability. 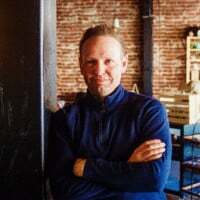 It’s important to keep negotiating the terms and demands of your goals, and what you can accomplish, with the agile, every changing needs of the organization and the clients they serve. Understand your own #leadership! In order to maximize the return of leadership development programs in your organization, you must first recognize how your self-leadership influences those around you. @InspireSoftwareTweet this! Balancing short and long-term objectives is not an easy task, especially when it comes to leadership development. Self-leaders need to be able to manage and adapt to constant change throughout the business to achieve sustainable results and cultivate continuous growth. Be Clear About Your Values. The way you lead is reflected in the relationships you have with colleagues. Set a clear personal mission statement and values that guide day to day decisions and are aligned with what organizational goals, as well as your own goals. Encourage employees at every level of the organization to do the same. Change Your Mindset. Goals are fluid and evolving, just like our daily lives. Plans change unexpectedly and require adjustments to realign leadership strategies to meet the demands of those changes. Take 15 minutes every day engage your mindset, evaluating where you’re at in pursuit of your goals, then have a simple plan that is both focused and flexible to work with your team and easy pivot to meet your organization’s changing needs. Establish a Common Leadership Language. No leadership development plan is an island – all plans require some consistency. If managers are using a common set of leadership competencies, it should be clear to everyone in the organization as to what is trying to be achieved through those competencies. It helps to be speaking the same language and evaluating performance in the same way to have truly effective collaboration and build leadership skills at every level of the organization. Plan Your Performance. Just as goals should naturally flow from your role in the organization, all of your daily tasks and activities should contribute to those goals. Without a plan for performance, you’re just reacting and not being intentional about how you manage your day. Take charge of your schedule, your time, and your daily leadership development plan. List and review key tasks and activities you plan to accomplish that day and cross them out when you complete them. Make sure you are mapping how your daily activities are aligned with your goals and improving your organization. Be Proactive. With clear roles, goals, and a plan to perform on a day to day basis, you should be ready to react to anything that comes your way during the day, while staying on track toward your goals and the strategy of the organization. When challenges or setbacks occur, don’t wait for others to solve the problem, use self-leadership skills to identify where you’re at in progress toward the goal, what has shifted, what the problems are, and how you plan to solve them. This doesn’t mean that you act in isolation, but that you’re prepared to take action--ready to lead. Leadership development starts from the ground up. That means honing and leveraging your self-leadership skills to fuel organizational leadership success. What organizational goals can your professional goals align with? How can you work with your team to achieve them? For a leadership development program to truly succeed it needs change, innovation, and a common foundation to operate from. The more people developing and using self-leadership skills, the greater the pool of innovation your leadership development program will have to draw from. Inspire Software builds tomorrow’s leaders today. Request a demo and see the benefits of a strong, successful and integrated leadership development program! Want to read more about self-leadership and other leadership contexts? Get your copy of Dr. Drea Zigarmi’s book, Achieve Leadership Genius!